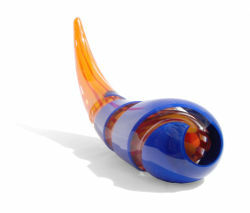 Blown and layered solid glass. 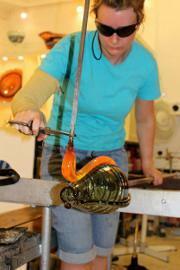 Glass is an extraordinary material to work with. Its special qualities make it beautiful, exciting and unique. The inspiration for my work derives from these qualities. 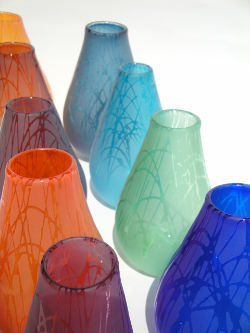 Through the exploration of glass as a sculptural material various themes have evolved. I would describe my style as graphic. 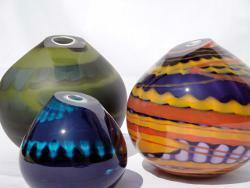 I like to play with the glass and the layering properties it encourages. 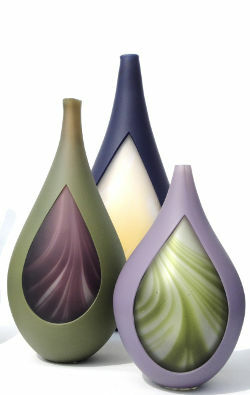 By playing with layers of colour, pattern and surface carving, I produce tactile pieces of glass. I employ hot glass techniques and cold worked decoration in order to achieve this. I love the idea of opposites. This consists of the development of form; colour; transparency; pattern and texture. I am also interested in the concept that touch is comforting, and I tend to choose textured surfaces and vibrant colour combinations that attract the eye and lift the heart. One of the great qualities of glass is transparency. By the juxtaposition of clear and layers of colour I am able to create 3D spaces within each form. The external carving creates a window into the inner worlds I create in each piece. The International Glass Centre, Brierley Hill, ENGLAND Professional Development Level 5, 2007 - 2008 SPECIALISING IN BLOWING AND COLD GLASS TECHNIQUES. Awarded 5 DISTINCTIONS. The International Glass Centre, Brierley Hill, ENGLAND Professional Development Level 4, 2006 - 2007 SPECIALISING IN BLOWING AND COLD GLASS TECHNIQUES. Assistant to Technician and Tutors, Stephen Foster and Jim Cartwright at The International Glass Centre, England SEPT 07 - JULY 08 - This included the production of work for other students such as overlays, Pastorelli roll-ups, cane and final pieces.